Western Washington wolf populations are growing at a dramatically slower rate this past year, prompting some environmental groups to urge the state to stop killing wolves that prey on livestock. SPOKANE — Growth in Washington’s gray-wolf population slowed dramatically last year, raising concerns from an environmental group that says the state should stop killing wolves that prey on livestock. At the end of 2017, Washington was home to at least 122 wolves, 22 packs and 14 successful breeding pairs, the state Department of Fish and Wildlife said in a report released last week. That’s the highest the population has been since annual surveys started in 2008, the agency said. However, last year’s count was up just 6 percent from the minimum of 115 wolves — with 20 packs and 10 breeding pairs — reported at the end of 2016. By contrast, wolf populations grew at a rate of around 30 percent per year the previous decade. Wolves are rebounding in several Western states after being wiped out in the continental United States in all but a slice of Minnesota. But their return has brought contentious discussions among conservationists, ranchers, hunters and others about how the animals should be managed. In Washington, Weiss has criticized rule changes last year that allow the state to take quicker action to kill wolves that attack livestock. Environmentalists argue ranchers should take more actions to minimize contact between their herds and wolves. Washington documented 14 wolves killed in 2017 through a combination of hunting, poaching, vehicle collisions or other causes. Three of those wolves were killed by members of the Colville Indian Tribe in a limited hunting season allowed on the reservation. Wolves are a protected species elsewhere in the state and cannot be hunted for sport. Another three were designated problem wolves and killed by the state. Ben Maletzke, a statewide wolf specialist with the state wildlife department, noted his agency employed an array of nonlethal strategies last year, including cost-sharing agreements with 37 ranchers who took steps to protect their livestock. State assistance included range riders to check on livestock, guard dogs, lighting, flagging for fences, and data on certain packs’ movements. Maletzke said five of the 22 known packs that existed in Washington at some point during 2017 were involved in at least one livestock death. The agency confirmed wolves killed at least eight cattle and injured five others last year. It processed two claims totaling $3,700 to compensate livestock producers for their losses in 2017. Wolves were wiped out in Washington early in the last century and began migrating back from neighboring areas earlier this century. 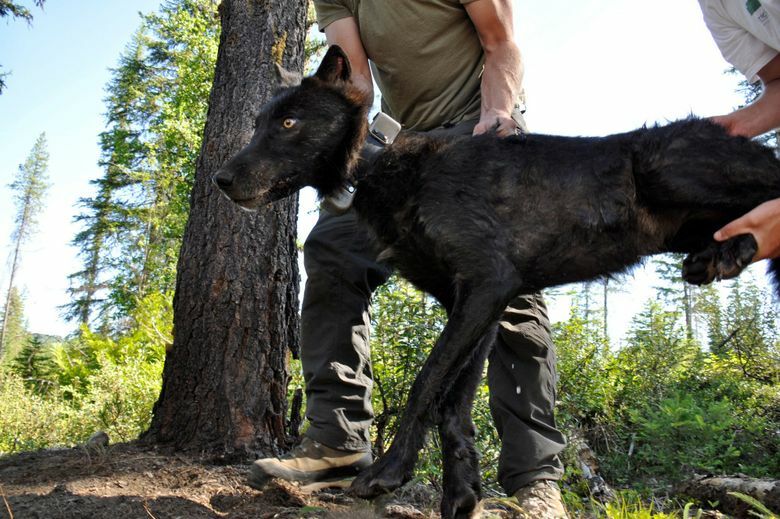 Their return has sparked conflict with livestock producers, especially in the three rural counties north of Spokane where most of the wolves live. “We’re glad to see that Washington’s wolf population continues to grow and are particularly excited to see a notable increase in the number of successful breeding pairs compared to past years,” said Mitch Friedman, executive director of Conservation Northwest. Still, officials are concerned because most of the wolf packs are found in northeast Washington, and there is little sign the animals are moving into the Cascade Range or the western half of the state. According to the 2017 survey, 15 of the 22 known packs range in rural Ferry, Stevens and Pend Oreille counties. Wildlife managers also have been tracking the movements of a wolf in western Washington’s Skagit County that was captured and fitted with a radio-collar in June, Maletzke said. Since 1980, gray wolves have been listed under state law as endangered throughout Washington. In the western two-thirds of the state, they are also listed as endangered under the federal Endangered Species Act. Fighting over wolves has moved to the courts. In September, the Center for Biological Diversity and Cascadia Wildlands sued the department for failing to conduct required environmental reviews before killing wolves. In November, the center filed a separate lawsuit against the department for allegedly failing to turn over requested documents pertaining to its wolf kills as required by law. “Wolf recovery in Washington is still in its infancy, and the population should be continuing to grow, not stagnating,” Weiss said.